Auxetic Textiles provides a detailed introduction to the basic properties of auxetic materials and how they differ from conventional materials, particularly auxetic textiles, such as polymers, fibers, yarns, fabrics and textile composites. 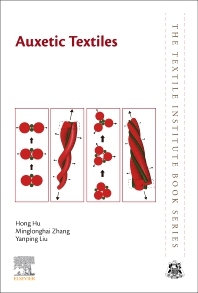 The book discusses the beneficial properties of auxetic structures in textiles and how to translate those benefits into actual materials development. Sections cover the deformation mechanism of textile structures to achieve auxetic behavior and the modelling and simulation of auxetic textile structures. Finally, the book provides expert insights into potential application areas. Cutting across textiles disciplines, from technical textiles and advanced composites, to fashion and design, the book is a valuable introduction to the field for newcomers, with potent insights into the potential of these materials. Hong Hu is a Professor in the Institute of Textiles and Clothing at The Hong Kong Polytechnic University. For many years, he has been teaching and researching in knitting technology, textile composites, 3D textile structures and mechanics. He is internationally recognized for his research work on 3D textile structures for composite reinforcement and auxetic textile materials for technical applications. Minglonghai Zhang graduated in Textile Engineering at Jiangnan University as BSc program and Textile Technology at the University of Manchester for MSc degree. He is currently doing PhD in the Hong Kong Polytechnic University and working with auxetic composites. Zhang used to do research about graphene composites and published one paper, got four authorised patents and one software copyright. Yanping Liu is an Associate Professor in the College of Textiles at Donghua University. His research interests lie in the development of new textile structures and processes with unusual properties for special applications such as impact protection, vibration isolation, and sound absorption using advanced experimental and numerical methods.